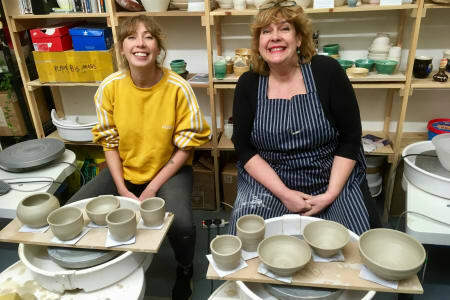 About the Studio: Located in a light industry building 10 minute walk from South Wimbledon or Morden Station (Northern Line), Studio 3 is run by two resident ceramic artists Clover and Emilia. 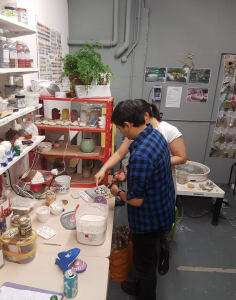 The studio is equipped with 8 pottery wheels, and over 20 glazes, two on site kilns and plenty of shelving to store works. 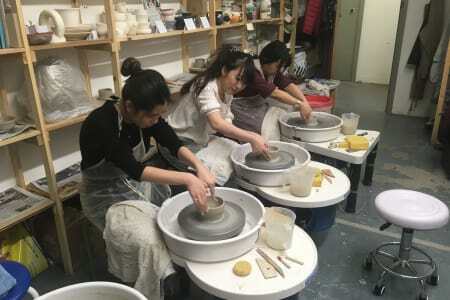 About the Classes: You will be taught in a relaxing and creative environment in a small group of up to 8, targeting on throwing on a potter's wheel. No previous experience of working with clay is required. Beginners will learn clay preparation, throwing and trimming. For experienced learners, we can tailor the workshop to focus on any techniques or shapes you would like to improve on. Our theTutors: Clover Lee: a London base craft potter, a finalist of BBC reality talent show The Great Pottery Throwdown 2017. 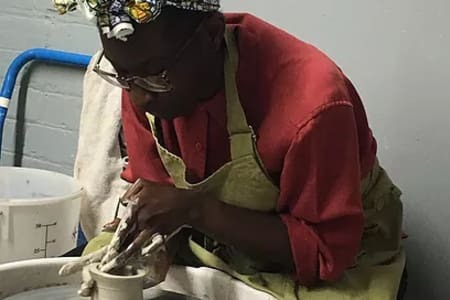 She started her pottery journey in 2011 as an evening student before becoming a full time potter in 2018. Clover is proud of her Asian heritage and creates a mixture of functional and stunning items - such as bonsai planters, decorative vases, sake sets, mugs and tableware. She says she is "inspired by the traditional art and culture of China and Japan". Emilia Radlinska: trained as a ceramicist at the Australian National University (Canberra School of Art). 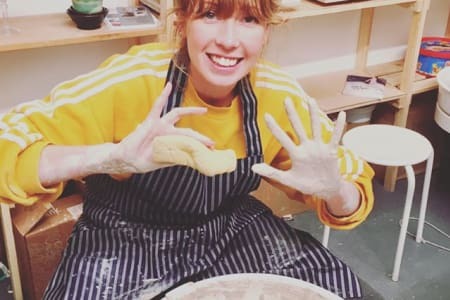 Since graduating in 2002 she has practised, exhibited and taught ceramics in Australia, the USA and for the last five years, at the Glasgow Ceramics Studio in Scotland. If you have any questions, please do not hesitate contacting Clover. Clover ran a brilliant class and I was surprised how much I managed to achieve in just a 2 hour session. Would most definitely recommend! Thanks so much Clover, Frankie and I had such a great morning with you. It was such a relaxed and inspiring environment - you helped us so much with our pieces and we're so happy with what we made! Can't believe we managed to make so much! Can't wait to pick them up 😊 Would definitely recommend and we're already looking to plan another session with our friends. The basics of throwing were covered and we enjoyed lots of hands-on experience on the wheel. The 2 hour workshop was great fun and it was good that we could take away 3 items we made at the end. It would have been good to have a little bit more time to go through the techniques but she came round and helped us individually and we managed to get a lot done in the time. Great fun and very relaxing! Great class, and Clover is an excellent teacher! This workshop was so much fun! The class size was perfect, so everyone got the attention they needed. Clover was an amazing teacher. We got stuck straight in and I made so many more pieces than I expected. I'll definitely be doing more! Lovely environment ~ I learnt a lot with fantastic results ~ thank you. A lovely introduction to pottery in a relaxed atmosphere. Clover is friendly and helpful and a great teacher. Two hours flew by, it's totally absorbing, and by the end we had all succeeded in making 3 or 4 pots. I had the most amazing day with Clover. I’ve never done anything with clay before and haven’t been creative in years. The hours just flew by as Clover taught me ‘step by step’ throwing technique. She is down to earth and patient and made learning a new skill fun! I can’t recommend enough. I will be back! I loved the class! Clover got us stuck in right away. Just the right amount of guidance and letting us try it for ourselves. Loved the studio - a fantastic way to spend the afternoon! I really enjoyed the class and great learning experience. Very therapeutic too! The workshop was excellent. Clover is a very talented and patient teacher. I can’t wait to collect my pots! I would highly recommend this class! Great fun - would love to come again! Can’t wait to see the finished pots! I have absolutely loved my 6 week pottery course with Clover. As a complete beginner I have really enjoyed learning a new skill and Clover has been thorough and helpful in every session, giving skills and advice, whilst also allowing you the freedom to create exactly what you want. A huge thank you!